More Caro-Kann Games @ "Diamondback Chess"
Blogger Diamondback has posted more games of mine as White, in the exchange variation of the Caro-Kann Defense. Last Friday, Garry Kasparov gave an unscheduled speech near Sochi in favor of a mayoral candidate. These pictures were taken by me on Sunday at the Westfield quads. Besides a game of speed chess played before the start of the tournament, you will see Mauricio Camejo versus NM Mark Kernighan and Ernesto Labate versus Sam Chatsky. Thanks to Mark Weeks, here is a link to Ralph Ginzburg's article on Bobby Fischer, from the January 1962 issue of Harper's Magazine. My opponent fell into an opening trap in this game, played at today's quads in Westfield. The correct move for Black is 5...dxe5. 35.Nc4 Rd8 36.Ke2 Ra8 37.Rd1 Ra2 38.Rd2 Ra1 39.Ne3 Ra6 40.Rd5 Rc6 41.h4 Ne5 42.hxg5 fxg5 43.Nc4 Nf7 44.Rf5 Rc7 45.Ne3 Rc8 46.Nd5 Nd6 47.Rxg5 Rh8 48.Rxh5 Rg8 49.g4 c4 50.Rh6+ Kd7 51.Nf6+, Black resigns. 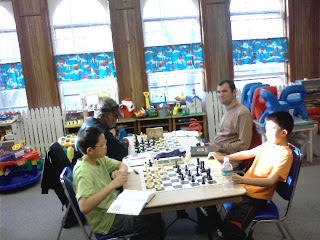 Here are a couple of my games from today's game/60 Swiss at the Marshall Chess Club, where I ended with a score of 2-1-1. 20.Ne3 Bb6 21.Ng4 Kh8 22.Rc6 Bxc6 23.Rxc6 Qb7 24.Rxf6 Bd8 25.Rxa6 Bxg5 26.Nxe5 Be3+ 27.Kf1 Rac8 28.g3 Rc1+ 29.Kg2 Qb4 30.a3 Qb3 31.Bc4 Rg1+ 32.Kh3 Qb8 33.Nxf7+ Kg8 34.Qh5 Rxf7 35.Qxf7+ Kh8 36.Re6, Black resigns. 28.Kg4 Kg6 29.Kf4 h5 30.Rc7 a5 31.Rc6+ Kh7 32.Ra6 Ra2 33.Kf3 g6 34.c4 Rc2 35.Rxa5 Rxc4 36.Kg3 h4+ 37.Kf3 Kh6 38.Ra6 Kh5 39.Ra5+ g5 40.h3 Rc3+ 41.Kf2 Rg3 42.Ra6 Rb3, draw. Here is a promo, with a chess theme, for the National Basketball Association. Using ChessFlash, blogger Diamondback has reproduced three of my games as White in the Exchange Variation of the Caro-Kann Defense. These games originally appeared in a previous blog post of mine. 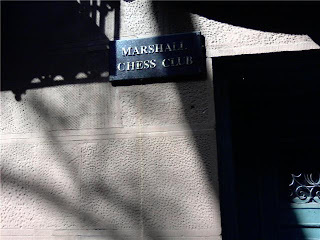 My win against Noah Siegel took place on 11/8/1995 at the Marshall Chess Club. 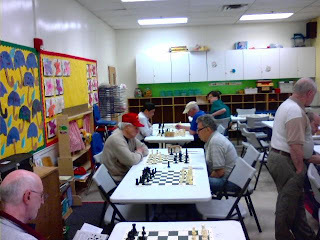 Tuesday night chess classes for adult players. 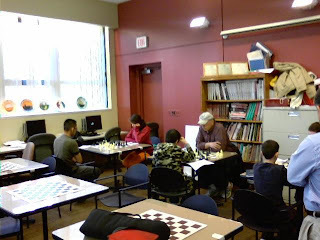 Free to members of the Marshall Chess Club, 10 dollars to non-members. Starts April 28th at 7:00 pm. The series will be based on The Mammoth Book of The World’s Greatest Chess Games. A master-level-or-better player will explain two games per week from the book. Over the course of the year, you will learn all aspects of master level chess. By studying these historic games, you will develop models of play that will greatly improve your results and performance. In addition, you will become more familiar with the history of the game and its greatest players. 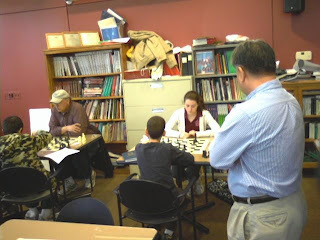 On Sunday, I snapped these photos during round one of the ICA Spring 2009 Open. 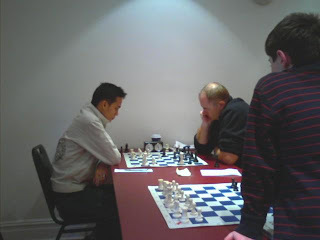 Andrew Ng defeated Arjun Mayur. NM Igor Yeliseyev bested Yakir Forman. IM Dean Ippolito won against blogger Polly Wright. 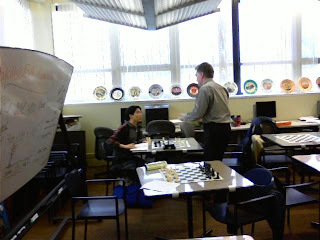 Austin Wang lost to GM Sergey Kudrin. Isaac Barayev was defeated by Anna Matlin. 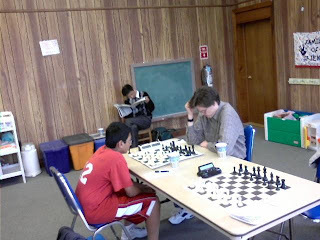 Paul Ton lost to Eve Litvak while Alexander Katz beat Mario Russo. These are photos from Saturday's quads in Hamilton. The first two pictures show players in quad one: Rahul Swaminathan versus NM Mark Kernighan, and NM Dragan Milovanovic defending against Kernighan. Next, there is a photo of quad two. Finally, there is a shot of the lower quads. 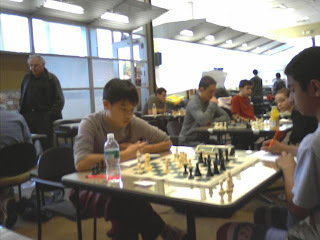 Earlier today, I finished with a score of 2-1-1 at the ICA Spring 2009 Open in Hackensack. Here are my two wins. 16.Qd3 Bxc3 17.Qxc3 Rc8 18.Qe3 Nc6 19.Nd4 Nxd4 20.Qxd4 Rc4 21.Qf2 Rac8 22.Rd2 Bf5 23.c3 b4 24.Rhd1 bxc3 25.Rxd5 cxb2+ 26.Kxb2 Qb7+ 27.Ka1 Rc1+ 28.Rxc1 Rxc1+ 29.Bxc1 Qb1#. 33.Rd4 Rf5 34.Re1 Rb8 35.Ree4 Rbf8 36.Rb4 Bc4 37.a4 Bd5 38.Red4 Bxf3 39.Kxf3 bxa4 40.Rxa4 Rb8 41.Rab4 Rbf8 42.Rxf4 Rxf4+ 43.Rxf4 Rb8 44.b4 Rd8 45.Ke2, Black resigns. 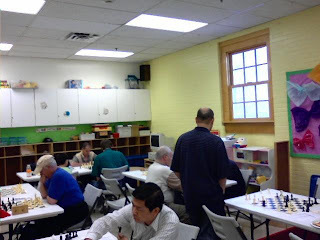 44 players showed up for today's quads in Hamilton where I drew this game. 49.Rb2 c6 50.bxc6+ Kxc6 51.Be3 Ne6 52.Bd2 Nc7 53.Bf4 Nb5 54.Rg2 Nc3+ 55.Kd3 Nd5 56.Be5 Kb5 57.Ke4 Nb4 58.Bd4 Kc4 59.Bxc5, draw. On April 26th, the South Jersey Open will be held at the Wyndham Hotel in Mount Laurel. Here is the original edition of Bobby Fischer's My 60 Memorable Games, published in 1969. "Analysis of the Game of Chess"
Here is Philidor's Analysis of the Game of Chess, originally published in 1749. 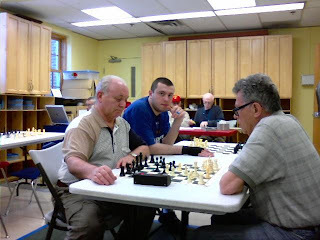 Here are photos from Sunday's game/30 Swiss at the Marshall Chess Club. 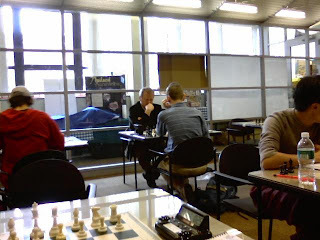 In round two, Gabor Schnitzler lost to Andrew Ryba. 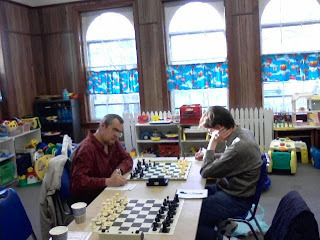 Meanwhile, Michael Bodek drew against Steadroy Lloyd, and Polly Wright was defeated by Alex Eydelman. In the same round, Lamel McBryde won his game against Mauricio Camejo. First place went to IM Oliver Barbosa who won all five of his games, including a third round victory against me. Here Barbosa is seen defeating Alex Eydelman in round four. At the end of your article "Alternatives to Alterman's PCG Analysis" on your web blog, you give three examples of games. However, they all say "This account has been suspended, please contact the billing/support department as soon as possible." Do you know where I could find these three games on the Internet? Thanks. 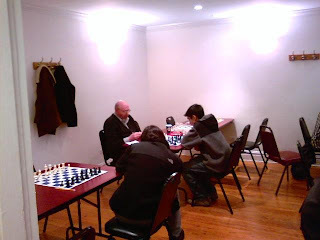 I have reproduced the games at my Jim West Talks Chess blog. 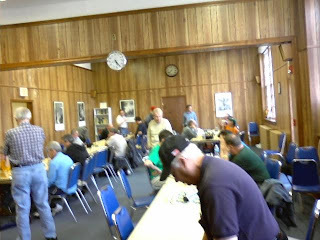 In today's game/30 Swiss at the Marshall Chess Club, I finished with a score of 2-1-2. Here is my draw from the first round. 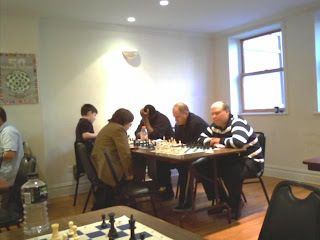 33.Kf3 Re1 34.Rd7 Re5 35.Rd5 Re1 36.Rd7 Re5 37.Rd5, draw. 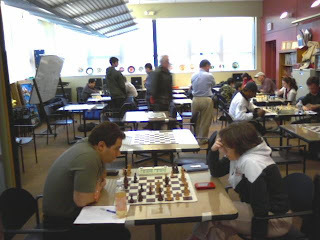 After five rounds, GM Yury Shulman leads the Foxwoods Open 2009 with a perfect score. For a couple of weeks, Chess Publisher has been down, stating "This Account Has Been Suspended." At least one website is optimistic that Chess Publisher will be up again soon. In response to Tuesday's post, Alejandro Melchor of Barcelona has sent me an e-mail, mentioning three games where Paul Morphy by transposition played Bc4 against positions that resemble the Philidor Counter Gambit, namely Morphy-Rousseau, New Orleans 1849 and Morphy-Schulten, New York 1857 and Morphy-Worrall, London 1859. But in none of these games did Morphy face the position after the move order 1.e4 e5 2.Nf3 d6 3.d4 f5. Instead Black played 2...Nc6 which Morphy answered by 3.Bc4, and eventually Black played ...f5. In every case, Morphy won. The most remarkable of these was his victory over Worrall because Morphy played the game blindfolded! Madman Genius: Bobby Fischer Found will chronicle the life of the American chess champion. The director of the film is Liz Garbus. In five games playing the Philidor Counter Gambit as Black, Paul Morphy never lost, winning three and drawing two. I have often wondered what line Morphy would have chosen as White against the PCG, guessing that he probably would have developed a piece by either 4.Bc4 or 4.Nc3. Actually there is game where Morphy favored 4.Bc4 over 4.Nc3, but there was little choice because he was playing at queen knight odds! The opening moves were 1.e4 e5 2.Nf3 d6 3.d4 f5 4.Bc4 fxe4 5.Nxe5, resulting in a drawn rook-and-two-pawns versus two bishops endgame. There is an error in the score of the game. Black played 34...Bb2, not 34...Bg7. Playing in the one-day schedule yesterday, I finished with a score of 2-0-2 in a Swiss tournament at the Marshall Chess Club. 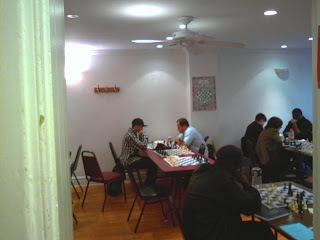 My games follow, including a lucky win in the final round when my opponent blundered a piece after having outplayed me. 30.h5 Rc4 31.hxg6 fxg6 32.f7 h6 33.Rd2 h5 34.Rh2 Kg7 35.Qf6+ Kh7 36.Rxh5+ gxh5 37.g6+ Kh6 38.g7+ Kh7, Black resigns. 12.Nxe4 Bxe4 13.e3 Rhe8 14.Be2 a5 15.O-O Bxf3 16.Bxf3 Ne5 17.Bxe5 Rxe5 18.Rfd1 c6 19.Rxd8+ Kxd8 20.Rd1+ Kc7 21.Kf1 Re7 22.Ke2 Rd7 23.Rxd7+, draw. 21.g4 Rd8 22.Re2 Rb8 23.Rg2 Re8 24.h4 Rd8 25.Ne5 Rc7 26.f5 exf5 27.gxf5 Nf6 28.fxg6 fxg6 29.Rgf2 Rd6 30.Nc4, draw. 44.Ra4 Kg7 45.Ra7 Rd7 46.Ra6 Nh5+ 47.Kg2 Rd2+ 48.Kh3 f5 49.Ra4 Kh6 50.Rb4 Kg5 51.f4+ Nxf4+ 52.Kg3 Rg2+ 53.Kf3 Rxh2 54.Kg3 Rh3+ 55.Kf2 Nd3+, White resigns.